When getting ready to purchase a tree(s) to plant on your front lawn, or other parts of your property, the tree’s height, when mature should be taken into consideration. The right sized tree can set off your house and landscape, while the wrong one can dwarf your house and even you. When selecting trees to plant directly in front of, along side, or right behind your house, don’t buy ones, that when mature tower over and dwarf your house. There is nothing worse than seeing a low slung ranch styled house, that is probably 15 to 17 feet tall at most, from ground level to point of roof, with 40 to 60 foot tall trees planted in front, along side, and directly behind it. The house in this scenario is 1/3 the height of the mature trees. There is nothing wrong with having a 40 to 60 foot tall towering tree(s), planted on the property where the ranch styled house is, but it is where you plant them that matters. When picking trees to plant on your front lawn, or any spot close to your house (on all sides), select ones that when mature are shorter than, or approximately the same height as your house. As you progress away from your house, outward onto your lawn space, in all directions, think about planting trees that have progressively taller growth habits the further they are planted from your house. Look at the bottom half of the cover illustration for this post. Notice the low right to high left progression of heights from the people to the towering trees. Think of the people as being close to the house, or on an open lawn space on their property. The couple on the right who are 5 to 6 feet tall, are in scale/counterbalanced by the planting of the 2 to 12 foot tall arrangement of bushes, and possibly a dwarf tree. There is a similarity of size between the two. The next tree to the left is 15 to 20 foot tall. It is kind of a transitional height, helping to bridge the people and bushes at ground level, on the right, with the 40 to 60 foot towering trees on the far left. To make an even smoother progression, from ground level to the 40 to 60 foot plantings, a second transitional sized tree growing 30 to 40 foot tall has been introduced. Your eye has now smoothly worked from low right to high left. The logical progression now back downward, from left to right is like stair steps, moving the eye from high to low, without having any quick downward drops. Sometimes your neighbors already have the tallest trees on their lawn. All you have to do is pick trees for your property, with progressive shorter growth habits, as you move away from their property line toward your house. In a way, you are borrowing part of their landscape plantings, and visually making them yours. When planting a progression of different heights of trees out onto your property, or planting different heights of trees, along side what is already there, you are visually opening up space, which created depth, and gives the eye different levels to look at. Now look at the drawing of the Cape Cod styled house at the top of the illustration. Notice the three pink flowering trees that are framing the front of the house. They could be the 15 to 20 foot tall trees shown in the lower part of the illustration. Notice that they are not as tall as the roof. The three trees are all the same variety and about the same size. By planting two on one side of the driveway, and one on the other side of the house, the eye easily moves from one side of the property to the other. If there were just the two flowering trees planted by the driveway, or the one flowering tree at the far right, the eye would land on either planting of flowering trees and stay there. Next look at the transitional sized trees in the illustration, They could possibly be the 30 to 40 foot trees shown in the lower part of the illustration. They are further away from the house than the flowering trees. In this case, they are the same height as the top of the roof or a bit taller. There is one behind the two flowering trees by the driveway, and one next to the single flowering tree on the right. There could also be a few more planted on the back lawn away from the house. All the transitional trees, in a way help lift your eyes upward in the direction of the 40 to 60 foot towering pines seen on the sides of the illustration. Now look at the low bushes and shrubs that are closer to ground level. They run across the front of the house and could be the 2 to 12 foot tall specimens. By going over, and examining the different heights of bushes and trees, hopefully you are now starting to see the different layers of plantings that make up a good-looking landscape project. Spacing Trees ..A lot of people have a hard time visualizing space. If you asked them to mark off a 12×12 foot space, they most likely couldn’t do it, especially outdoors. When thinking about planting trees on your property, first go out to your local garden centers or big box hardware or discount store that has a garden center, and see what they have to offer. Your local garden center will most likely have the more unusual and the big box stores will have more common varieties that are often seen. Before buying anything, look at the tag on the plant that tells you how tall and how wide it grows, and what kind of sun and soil conditions it prefers. Those height and width numbers are just averages, your tree could grow even taller and wider, if it likes the site you put it in. Write down those numbers, if you are thinking of buying the tree. At your house, take a bamboo garden stick (which you can buy in bundles at garden centers everywhere), and stick one right in the ground at the place where you think the center of the trunk of the tree you want to plant will be. If the tree tag says it grows 30 feet wide at maturity, take a 15 foot length of string and tie it to the bamboo pole. Stretch the string out 15 feet from the center, and start walking around the center stick. As you walk around, stab other bamboo sticks into the ground to mark off what a 30 foot diameter circle looks like. The question now is?? Is 30 feet wider than what you thought it was?? If you planted a tree, that has a 30 foot wide growth habit, would it be touching your house, or growing over your roof? Would it block your walkways, grow too close to other plantings or encroach on your neighbor’s property, or cause some other kinds of problem? If the answer to any of these questions is yes, look for a different kind of tree with a narrower growth habit. Marking off space is important when planting many trees in a row to create privacy, block views, or make a wind barrier. Too often trees, especially evergreens, are planted too close together for a quick fix NOW. In time they will be crowded, which causes them to start loosing lower branches, because of the lack of ability to collect sun light. Their growth habits will start to just be upward, making them tall and spindly. They will keep stretching upward and competing with the other trees planted along side of them for sunlight. By knowing how wide a tree will be at maturity, and by then marking off each consecutive space, one after another, as just discussed, you will be able to site you trees so in 10 to 20 years, they will all be properly shaped and healthy. Proper spacing of trees will let them grow to their natural shape. When picking out trees for your property, try to select ones with different shapes and sizes of leaves and needles. Diversity and opposites are ideals when making an interesting arrangement of foliage. Plant a long needled evergreen or two, next to an evergreen with short needles. An oak or maple should not be planted next to each other. Their leaves are too similar looking. Pick something instead, that possibly has an almond or fan-shaped leave. Having trees and bushes with different colors of foliage also adds to your landscape. Don’t have everything green. Try to plant in multiple spots, trees, and bushes of all sizes and varieties, that have leaves or needles that are blue-green, burgundy, chartreuse, and gray-green. Variety makes for interest. Just move the different colors of foliage along, as I talked about earlier in this post, when I told you about the pink flowering trees in front of the Cape Cod styled house. When getting ready to site trees on your property, take into consideration the locations of underground electrical services, water pipes, sewer lines and septic tanks, as well as gas lines and overhead electric wires. Don’t plant trees where their roots or branches will bother utilities. Also, some trees have very large aggressive roots that could affect the foundation of your house. Don’t plant something in a place where you will regret it later. Save yourself the headaches and money. If you’ve found the trees that you want, and you know their mature growth habit would be fine at your house, do one more thing. Try digging a hole(s) in the exact spot(s) where you will be planting that / those trees. Look to see if there are too many big roots in the ground which make it impossible to dig the hole, or if there are giant rocks under the ground that you can’t lift and get out of the way. If you can dig the hole, you will be able to plant the tree. Finally, If you have the money and can afford some special / exotic trees, buy them and plant them closer to your house, so you can see them all the time. Plant less expensive (more common) trees further out on your land. Try not to have (get) what the neighbors have, if you are looking to give your house and land your own personal style. Copying is said to be the sincerest form of flattery, but you don’t want your house to look like all the others on the block. This entry was posted in Bushes, Shrubs, Trees, Garden Design Principles, San Francisco Chronicle / eHow references or resources, The Autumn(Fall) Garden, The Spring Garden. Bookmark the permalink. I came across one of your pieces by chance and am so HAPPY to have found you! 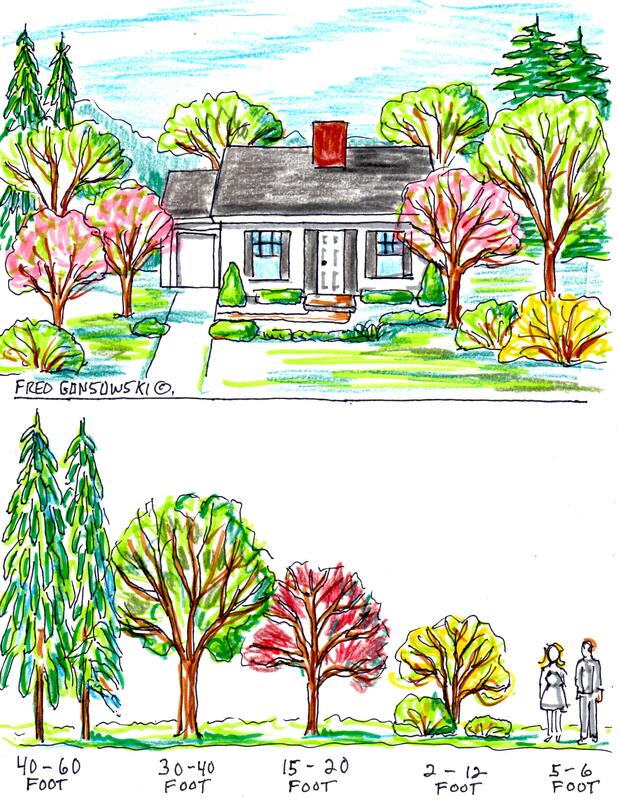 Your illustrations on how to arrange evergreen foundation shrubs will help me “smile” so much more after a thorough re-design! I see now have too many (pretty) specimens scattered across the front of my house and not enough repetition or evergreen backbone. It’s also a huge plus that you show plant material that will grow in my NW Pennsylvania yard. Hi there Paula, glad to be of help. Now is the perfect time to transplant things, so they have time to acclimate themselves to their new homes before they go to sleep for the Winter. Just make sure you give them a lot of water until the ground freezes, they will be most appreciative. Although I’ve gotten a handle on what went wrong with my landscape, I haven’t mastered how to arrange everything. Racing the calendar! Is it better to create vignettes of plant combos that work well, and then tie them together (across the front of my home) by repeating one plant in all the groupings? Or do I plant in drifts of 3 or 5 of a single variety, next to 3 or 5 of another complementary one? My next step may be to search online for an interactive garden layout solution that has a database built in and can approximate what my chosen planting scheme would actually look like. That way, if it looks too jarring or not cohesive, it can be changed without stressing out the plants – – or my back. Do you know of anything like that? I thoroughly enjoyed this article (and several more) today. You wonderfully articulated many questions I have been pondering and answered them concisely and with great examples. My wife and I are both technical people with passions for the arts – your systematic approach combined both with artful use of color, texture and sketch art, bringing the subject to life with full illumination. Thank you so much!